Double-click on the Wrinkle tool and you get some extra settings. You can see the ‘’Horizontal’’ and ‘’Vertical’’ settings that are used to control the direction of the wrinkles. If you are doing an image that is complex due to multiple anchor points, then you should select ‘’Brush Affects In/Out Tangent Handles’’ in order to restrict the effects of the tool. If you want to add a slight texture to any ornamental design, then you can hold the Wrinkle tool for a longer time and it will create more wrinkles on the image. So, the tool helps in putting wrinkles on the smooth surface and edges of an image. Double-click on the Pucker tool after you have selected an image to work on. Then, change the intensity as per your liking.Pucker tool draws multiple points on a path together. The tool gathers the points together and in the process it shrinks the total area.Pucker draws points together and it will continue to do so when you drag the brush across an image. The intensity selection will put dramatic effects on the image. Here you get stretching effect on the image as it goes away from a mid point. You can use Scallop tool to create different varieties of designs by using the settings of your choice. If you choose higher number from the setting for ‘’Complexity’’ and ‘’Detail’’, the effect will be of a thicker black stroke. So, you have the liberty to choose the complexity, detail and intensity as per the requirement of the design. The Bloat tool shapes the objects and is similar to wrap tool in this purpose. But bloat tool bloats inward and outward of an image. Select an image for bloating purpose. You can draw a rectangle and fill it with some gradients. Then, double click the Bloat tool to change the intensity of your choice. Now, you can start bloating the rectangle in the shape of your choice. You can notice the effect in the form of a bloated circle in the middle of the design. Although quite similar to the Scallop tool, the Crystallize tool is similar to the Scallop tool in its use and features. But Crystallize tool is capable of creating a starburst effect. This means that you can create an effect similar to a group of stars bursting magnificently out from an image. 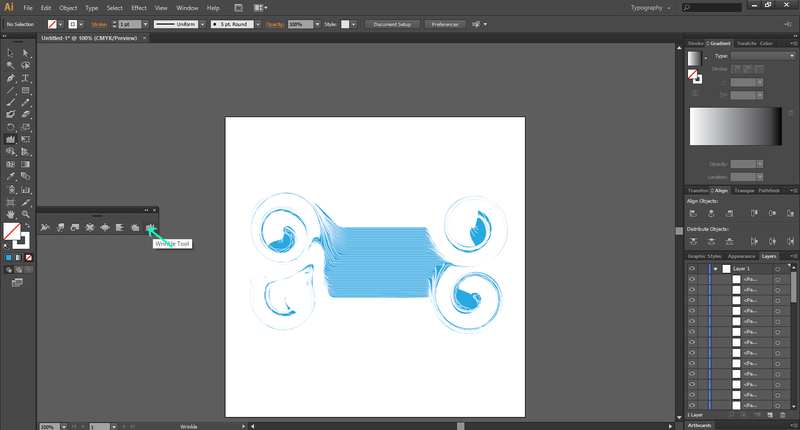 Typically, the designers use this tool to create animal illustrations. You can also draw fungus with the help of this tool. Just double click on the Crystallize tool and set the intensity as per your choice. You need to click on different areas of the image and change the size of the brush in order to create different looks. You can also erase the brush strokes you do not like as you hit Ctrl+z. For creating some spiked effects, you should click outside of the image. Select the crystallized tool for the image. Get the star burst effect on the image. Looking for Customized, On time, Logo Designs? Launch a Corporate Logo Design Contest today. Choose from 100+ designs. Take your pick! We offer a full 100% money back guarantee! Finally, a risk-free way of getting a customized design. Like our blog? Follow us on Twitter, Facebook and Linkedin.